Vancouver Island, BC has the largest concentration of cougars (Mountain Lions) in North America. This ia an alert, secretive animal that is rarely ever seen, which makes hunting them a real challenge. At Trophy West Guide Outfitters we use experienced hunting guides and exceptional cougar hounds to turn this challenge into an exciting and rewarding British Columbia cougar hunting experience. A BC cougar hunting trip is an opportunity to harvest one of North America's most efficient predators as well as providing some memorable photo and video opportunities. 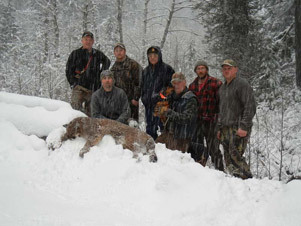 Cougar hunting on Vancouver Island depends a great deal upon the weather. Conditions consisting of cool temperatures and snow increase the hunter's odds for a successful cougar hunt. Because we are located off the West Coast of British Columbia right on the Pacific Ocean, weather patterns can change quickly. Here on the island if it isn't snowing during the winter months, it is more than likely raining. Having rain and wet conditions make it near impossible for the dogs to stay on the scent of a cougar track. With snow and cool temperatures locating a track is made easy, as well, optimal conditions allow us to differentiate between large males and females and provide a good indication on the age of a cougar track. Once road access has ended and the cougar track enters heavy cover the hounds are released and begin trailing the cat until treed. The actual trailing can vary from a short 5 minute "pop up" to an all day marathon. Once the cat is treed every effort will be made to get as close as possible to the area by accessing one of the many logging roads that wind their way through our area. The final push to the tree will be made on foot in a variety of terrain. 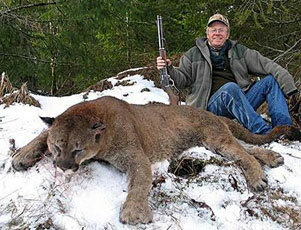 We can tailor your Vancouver Island cougar hunt to your physical condition. Historically, the months of January and February produce favorable weather conditions for hunting Mountain Lions, but it is our recommendation that a client be on an "on call" basis to increase the chances of a successful hunt. We would do our best to give a client as much notice as possible. 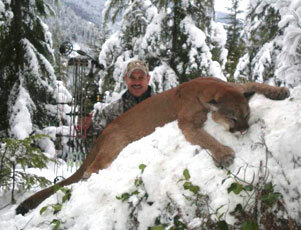 With a very strong cougar population on Vancouver Island, hunters have the option of taking two cats during their hunt. Harvesting a small number of Mountain Lions out of our area each winter helps maintain a healthy balance in our wildlife populations. The accommodations for our Cougar hunting trips is at the Lodge in Sayward, overlooking the beautiful Salmon River Valley.